Would you like to be part of the next University-wide Community Festival being held on Saturday 15 June 2019? As part of our commitment to enhancing our relationship with members of our local communities, we will be holding our annual University-wide Community Festival on 15 June 2019 from 11.00am-4.00pm. Last year over 2,000 people, many from our local neighbourhoods enjoyed the day with many speaking of seeing lots of friendly smiley faces having fun and enjoying themselves. Find out more about the 2018 event here. Next year’s Festival will be centred round Manchester Museum, University Place and Brunswick Park. Building on the success of the last two years, we would like to offer our local neighbours the opportunity to discover the wide variety of things we do, to meet us and to find out what opportunities are available for them. We look forward to seeing you at the Festival next June. CALL FOR APPLICATIONS: Science Spectacular – our annual university-wide family fun science fair – returns for the Manchester Science Festival 2018, and we hope you can join us. Science Spectacular is a key event in the University’s calendar of public engagement events. It provides an interactive showcase for the exciting research taking place across the University and offers the opportunity to engage with audiences of all ages. Running since 2011, we typically attract around 2,000 visitors and have featured prominently as a highlight of MSF. If you haven’t heard of Science Spectacular before, then check out our photo gallery. This year Science Spectacular will take place on Saturday 20 October 2018, 11am – 4pm, in the Whitworth Building and Manchester Museum. We are looking to host 40 interactive table top science stalls. So if you’d like to be a part of this year’s event, please return the attached Applications of Interest form: ScienceSpectacular_MSF18_Proforma_2018 (doc) by Monday 1 October 2018. I’m planning on taking some demos out to a family community festival in Longsight on Saturday 23rd June and am looking for volunteers. It’ll be picking up from Oxford Road campus about 11.30am and getting back about 5pm, and lunch is provided. A large scale book themed free family festival. We are looking for scientists who can explain how lightning or electricity works for the Percy Jackson and the Lightning Thief Zone in a fun and interactive way. It could be fun activities about static electricity using bubbles and balloons- it could be anything you like! 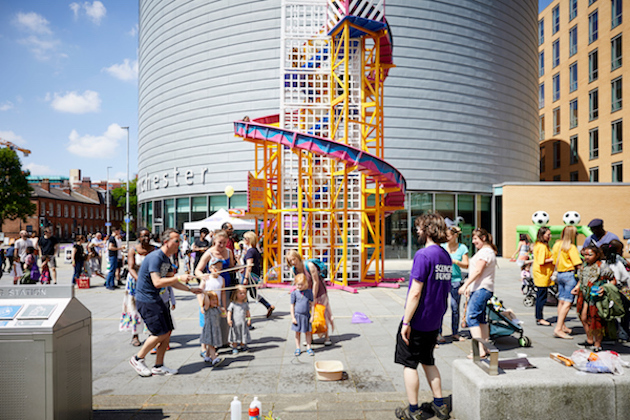 The activities run from 1pm- 4pm and we expect around 3000 visitors so whatever you choose to do will need to be something simple and repeatable! We suggest you will want to be on site by 12pm to set up. A delicious free curry lunch will be provided. You will be working in gazebo in a field across from Stanley Grove Primary Academy (M12 4NL) in Longsight. Get in touch with me if interested! Following the huge success of the first University-wide Community Festival in 2017 we are looking for staff and students to offer an activity at our 2018 Community Festival on Saturday 16 June. As part of our commitment to enhancing our relationship with members of our local communities, we held our first University-wide Community Festival in June of this year with nearly 2,000 visitors coming along to find out more about our work, have fun and try out some of our activities. The next Community Festival will be on Saturday 16 June 2018 from 11am-4pm centred round Manchester Museum, University Place and Bridgeford Street. From family-friendly table top activities to guided tours and musical performances, we are looking for expressions of interest for those wishing to get involved. The Festival aims to enhance our engagement with our local neighbouring communities by running a free, fun and interactive pan-University event that appeals to individuals and families and provides opportunities for them to engage with the a variety of University activities e.g. research, learning, sport, cultural institutions and our students. This year the University will be holding its first University-wide Community Festival on Saturday 17 June 2017. The event builds on the successful community open days run by the former FLS and MHS. The University’s new Inspiring Communities plan highlights our commitment to enhancing our relationship with members of our local communities. One way we hope to achieve this is by running a free engaging pan-University community open day when we throw open our doors for our local neighbours to discover the variety of things we do, to meet us and to find out what opportunities are available for them. This year we are running a small pilot event on Saturday 17 June 2017 from 11.00am – 3.30pm centred round Manchester Museum, the Martin Harris Centre and Coupland Street with opportunities for tours of specific campus buildings. The aim is that this would become an annual event in the future.